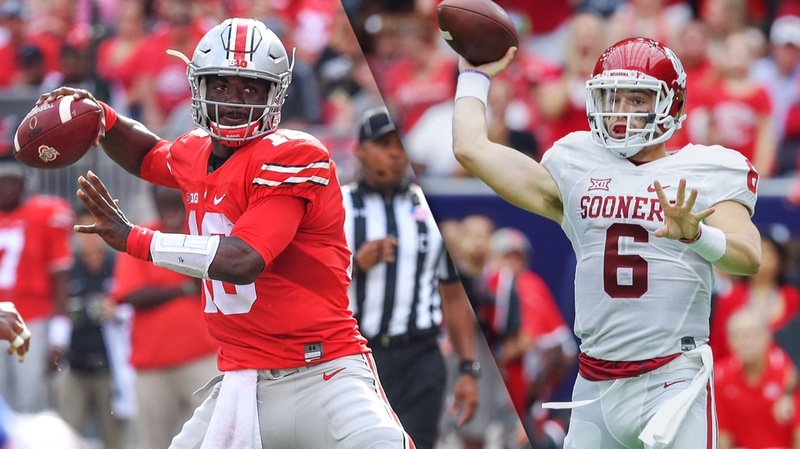 The 2nd ranked Ohio State Buckeyes take on the 5th ranked Oklahoma Sooners, Saturday Sept. 9th, 2017 In Columbus, Ohio. Last season these two met and Ohio State came out on top with a score of 45-24. The Oklahoma Sooners come into this game after a win over UTEP, by the score of 56-7. This will definitely be the biggest test for head coach Lincoln Riley. The big players for the Sooners will be Baker Mayfield and Jeff Badet. In week 1 Mayfield threw for 329 yards with 3 touchdowns. Jeff Badet had 4 catches for 91 yards. The Sooners will be playing without cornerback Jordan Parker but his replacement will be Parnell Motley. Another big key to this game is the defense because we know the offense can score. On defense we need to look at Ogbonnia Okoronkwo and Caleb Kelly. In week 1 Okoronkwo had 4 tackles and 2 tackles for loss. Kelly had 2 tackles and one forced fumble. This season Oklahoma is known to have the best O-Line in the country. The Ohio State Buckeyes beat Indiana by a score of 49-21. For Ohio State this is the home opener and the Buckeyes are 114-9-4 all time in home openers. Two players to watch for with this offense are J.T. Barrett and J.K. Dobbins. In week 1 Barrett had 304 yards passing with 3 touchdowns. Dobbins had 29 carries for 182 yards and he averaged 6.2 yards per carry. The defensive front is a huge part of this team, with Tyquan Lewis, Nick Bosa, Sam Hubbard and Jalyn Holmes. This matchup will be huge because of how good the Oklahoma O-Line is and how good the Ohio State D-Line is. I think Oklahoma wins this game because of their intensity on the offensive side of the ball. The Sooners will need Abdul Adams to run well and to balance out the passing game. The Defense is going to have to put pressure on J.T Barrett and J.K Dobbins to win this game.